Check out media coverage on WSET. University of Lynchburg is one of only 16 institutions nationwide to receive a Community Action Grant from the American Association of University Women to increase interest in STEM. The $7,000 grant allows LC to partner with Hunton-Randolph Community Center and Lynchburg City Schools. The one-year grant focuses on sustainability with a “Girls Go Green 4 STEM” theme. After the recent weeklong camp at the Hunton-Randolph, there will be monthly meetings for the participants as well as quarterly meetings for their families. “Hopefully we’re molding their minds to like science a little more,” said Alexandra Einstman ’13, a biomedical science and chemistry major at LC who is helping with the program. Samantha Meiser ’13, a chemistry major and math minor, is also working with the girls. “We talked to a rocket scientist yesterday and a biologist today,” rising sixth-grader Tyshala Ford, said during camp. Tyshala said the Skype interviews with scientists were among her favorite events. 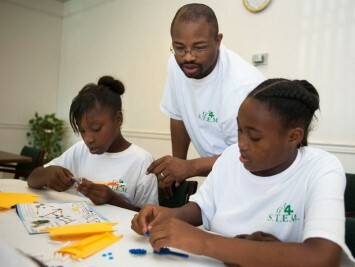 Dr. Dwight Williams, who developed the STEM curriculum, said the Skype interviews were with African-American female role models: an engineer of the year, a biologist from Virginia Union University, and a chemist with the National Institutes of Health who has her own hair care and beauty line. “Some of the young ladies use her products,” Dr. Williams noted. 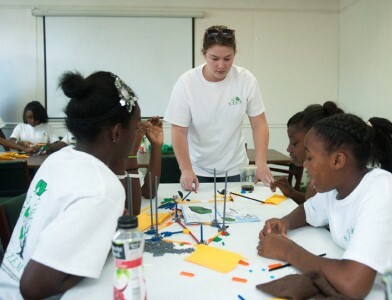 Many of the girls said the team-building exercise to create a model roller coaster was their favorite. “It was just fun; I liked it,” said seventh-grader Shimiyia Turpin. He said he’s impressed with the girls’ problem-solving skills. For example, they had to figure out how to measure different colors of light to determine which produced the most solar energy for their model solar cars. “They came up with it on their own,” Dr. Williams said, and learned that red is best. Located in inner-city Lynchburg, the Hunton-Randolph’s mission is to provide educational, enrichment, and recreational programs to families. The STEM project director is Paula Lichiello, assistant dean of LC Graduate Studies. The project lead teacher is Dr. Williams. They will be working with David Moseley, HRCC Board President, and Pat Price, interim director of LC’s Center for Community Development and Social Justice, to continue the project.